There's a special delivery at the Adelaide Zoo this afternoon, with the arrival of a female Sumatran Orangutan it's hoped will breed a new generation of the critically endangered species. 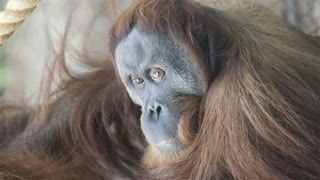 Puspa is being flown in from Perth, where she was born, and will be kept behind closed doors for now, as she gets to know the Zoo's male Orangutan, Kluet. "The plan is hopefully in the near future once she's settled in and we give her some time to hopefully breed with our male Sumatran Orangutan Kluet...it would be wonderful if that could happen," says the Adelaide Zoo's primate-keeper Jodie Ellen. There could be an additional benefit from Puspa spending time with the Zoo's female Orangutan who is yet to successfully raise a baby. "We're hoping that with Puspa here who's a proven Mum, she's successfully bred before, that we'll be able to breed with Puspa and hopefully Karta will get to learn some good mothering skills and that will rub off on her and hopefully she'll breed as well," says Ms Ellen. Ms Ellen says they'll take the getting to know you process between Puspa and Kluet slowly. "Thankfully I have her keeper coming up here today as well so I'll get to spend some time with her and learn all about Puspa's characteristics and so we'll monitor her closely and of course we'll do lots of really slow introductions through mesh and things until we take it to that next stage of having contact with each other." She says it's been many, many years since a baby Sumatran Orangutan was born at the Adelaide Zoo, and even though Puspa is 35, she should still have a few years to breed. "Which is of course so wonderful for Adelaide zoo because baby Orangutans are awfully cute but being ambassadors for their species this is a wonderful way for us to get the education message out and let people know just how critically endangered the Sumatran Orangutan are and be able to let people know what they can do to help out."